Orchestral gothic horror instrumental music with sound effects designed to spark your imagination. 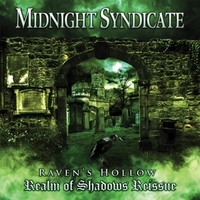 A re-issue of Midnight Syndicate's 2000 gothic instrumental classic, "Realm of Shadows." One of the early albums that helped define the band's signature sound, this re-issue features the original recordings, a new introductory track, and a previously unreleased bonus track entitled, "Serenade," taken from the original studio sessions. "Far beneath the shadow of the Dark Tower and beyond a clearing known as Raven's Hollow lie the ruins of a village. No one is certain what arose from the deep the fateful night that the village was laid to waste, but travelers now report shadows moving through the deserted streets and a solitary light shining from the old town square. Dare to discover the curse that befell this forsaken place as you venture forth into the Realm of Shadows." Midnight Syndicate is Edward Douglas and Gavin Goszka. As one of the top-selling Halloween music groups of all-time, Midnight Syndicate has amassed a worldwide following over their twenty-year career. A staple of the haunted attraction, amusement park, Halloween retail, gothic music, and roleplaying game industries, their catalog includes fifteen studio albums and three movie scores. Described as “soundtracks to imaginary films,” Midnight Syndicate’s albums blend orchestral instrumental music with sound effects designed to set an atmosphere while transporting listeners to worlds of their own creation. This particular album has been used as intro and outtro music at concerts by horror music icons King Diamond and Misfits, as well in countless haunted attractions, amusement parks, and Halloween events for almost two decades.